Not too big or too small – just right! The Vapamore MR-75 Amico Handheld Steam Cleaner was designed with the avid detailing enthusiast in mind. This lightweight steam cleaner packs enough power for most interior and exterior applications, at a price that won’t offend budget-conscious enthusiasts. The Vapamore MR-75 Amico Handheld Steam Cleaner provides an environmentally friendly way of cleaning interior and exterior surfaces – say goodbye to caustic cleaners! Let’s be honest for a minute: you’ve been thinking about purchasing a steam cleaner since you discovered how well they clean, degrease, and sanitize delicate interior surfaces. Until now, you had to shell out hundreds of dollars and, in some cases, upgrade the electrical system in your garage to handle the excessive amperage that larger units require. 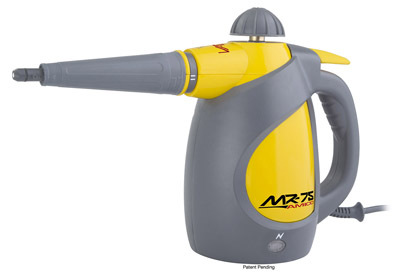 Vapamore, an industry leader in automotive steam cleaners, has a solution for the car care enthusiast that doesn’t need a commercial-grade steam cleaner and that unit is the MR-75 Amico Handheld Steam Cleaner. 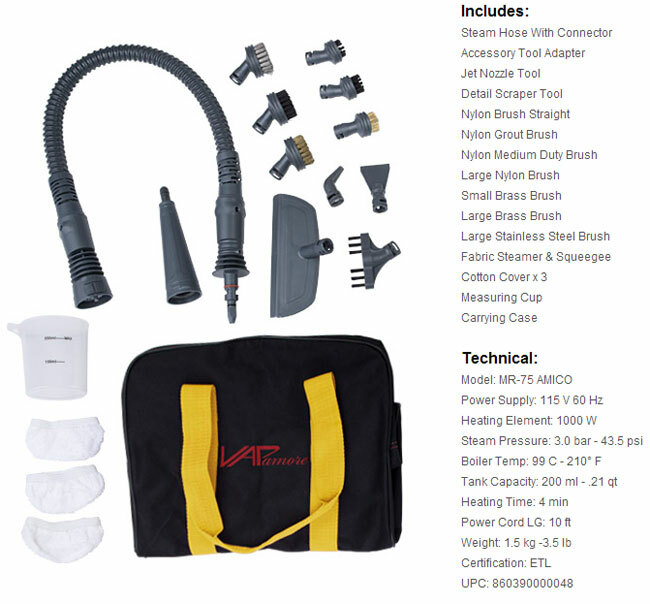 The Vapamore MR-75 Amico Handheld Steam Cleaner includes more accessories and attachments than any other handheld steam cleaner. From the jet nozzle tool to the detail scraper tool, you’ll be able to clean virtually every automotive surface – inside and out. Don’t stop at your car! The Vapamore MR-75 Amico Handheld Steam Cleaner includes a host of attachments that can be used around the house, including a specially designed attachment for cleaning fabric and a rugged nylon grout brush. Are bed bugs a reoccurring problem? The Vapamore MR-75 annihilates them with ease! Parents love the Vapamore MR-75 Amico Handheld Steam Cleaner because it cleans and sanitizes counter tops and bathrooms without using high-octane, caustic chemicals.